View More In Motion Detectors. You can program one chime for one door transmitter and a different chime for the other one, so you know which area to go answer. 3.When receiver get into pairing mode,you should immediately active the motion sensor pair with the receiver in 5 seconds. You will hear the tone you selected which mean your operation is successfully. Then on this receiver to choose a different chime for the other one motion sensor and following the above pairing instruction to make them paired is fine. Here at PHYSEN,we encourage you to make use of our Worry-Free Lifetime Warranty Guarantee. A happy purchasing experience is the utmost importance to us and we will happily send a product replacement if any issues arise. [Motion Sensor Distant] PHYSEN Wireless Doorbell Sensor, detect movements between 16.5ft/5m to 110 degree. Transporting signal to receiver within 500ft/150m in operating range, an activation for the receiver to alert. [Ringtones with Volume Level ] Provide 52 different options of ringtone; from melody sounds to simple basic buzz. Along with 4 levels of adjustable volume from 25-100 dB . Never having to miss a visitor or customers walk-in. [Easy to use and Expandable] No wires in-wall installation. 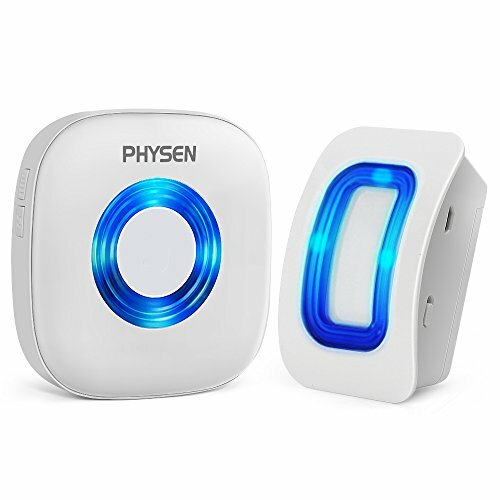 PHYSEN Motion Sensor Alarm is battery operated for fast and easy use. If you have more than one driveway or area you would like to monitor, you can expand add more sensors or receivers as you like,just following the pairing instruction to make them paired before using is fine. If you have any questions about this product by Physen, contact us by completing and submitting the form below. If you are looking for a specif part number, please include it with your message.